At the AWTRS conference the AWTRS sponsors an evening for ECRs to socialize. These events are a great opportunity for our ECRs to do some networking with peers and friends in a friendly environment. 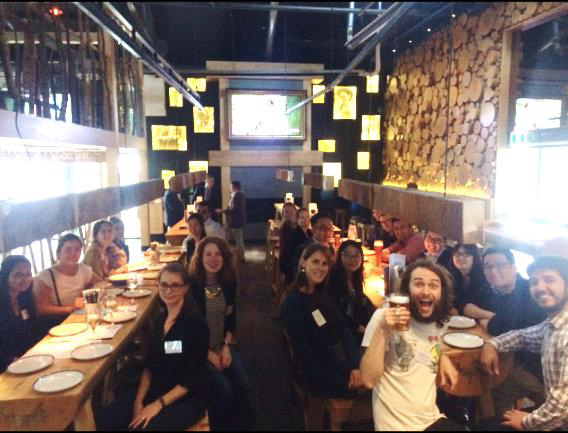 The last ECR event was held at the Munich Brauhaus in Melbourne, during the first Joint Australasian Wound & Tissue Repair Society (AWTRS) and Molecular & Experimental Pathology Society of Australasia (MEPSA) at the Melbourne Convention and Exhibition Centre from November 7th to 9th 2016. The next ECR event will be held at our Cutaneous Biology 2018 meeting. In combination with the Australian Academy of Sciences and a generous grant from Theo Murphy Initiative (Australia) the Cutaneous Biology Meeting 2018 we will hosting two EMCR sessions and an ECR social events. Details will become available on the Cutaneous Biology 2018 meeting website as the sessions are organised. Be sure to register for the next AWTRS conference (Cutaneous Biology 2018 meeting) and keep an eye for the newsletter and details of the awards as they open. Several research awards including best poster and best podium presentation awards will be available at the conference. © Copyright 2018 Australasian Wound & Tissue Repair Society.